Overtime increased by a huge extent last year with an additional €23.5 million paid out to the force’s 28 regional divisions. THE AMOUNT OF money paid to gardaí for working overtime has increased by over 50% in the last year. Last year, €68.3 million was paid in overtime to those working in the 28 Garda regional divisions, as compared to the €44.8 million paid out in 2015, a massive increase of 52%. The increases being seen are country-wide, with only the Clare division seeing any sort of fall in overtime spend. Perhaps more than any other State profession, overtime is generally seen as something of a given for gardaí given the unpredictable nature of the job. With the vast majority of hikes being seen in the Dublin divisions, the effect of both the ongoing Hutch-Kinahan gangland feud and the gardaí’s ramped-up efforts to deal with the perpetrators can clearly be seen. Seven people have died as a result of that feud since February 2016, two of whom were victims of mistaken identity. These figures do not account for the total overtime bill, with the Garda national units and the service’s headquarters in the Phoenix Park not disclosed. In recent times, the force has been dogged by a series of scandals, from the Maurice McCabe/Tusla saga (which has led to the current Charleton Tribunal of Inquiry) to the questions surrounding how one million breath-test results were seemingly falsified, to name just two. Analysing the numbers released under Freedom of Information to TheJournal.ie, it can be seen that in every single division bar one, the amount spent on overtime has increased significantly, albeit to varying extents. 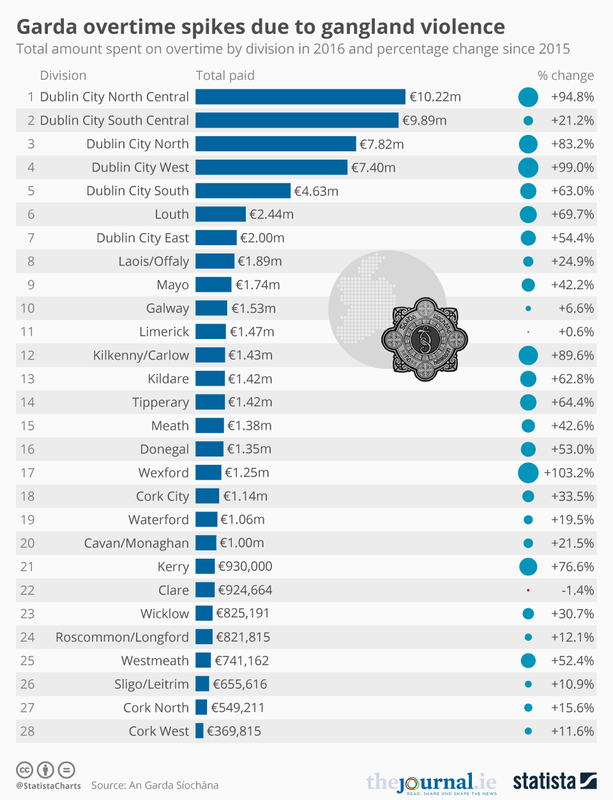 Outside the capital, significant increases in spending can be seen in Louth (up €1 million, +69.7%, to €2.4 million, the largest budget outside Dublin), Kilkenny/Carlow (site of many of the arrests seen as part of Operation Thor, up 89% to €1.4 million), and Wexford (with a 103% increase to €1.2 million, the single largest percentage increase in the country). 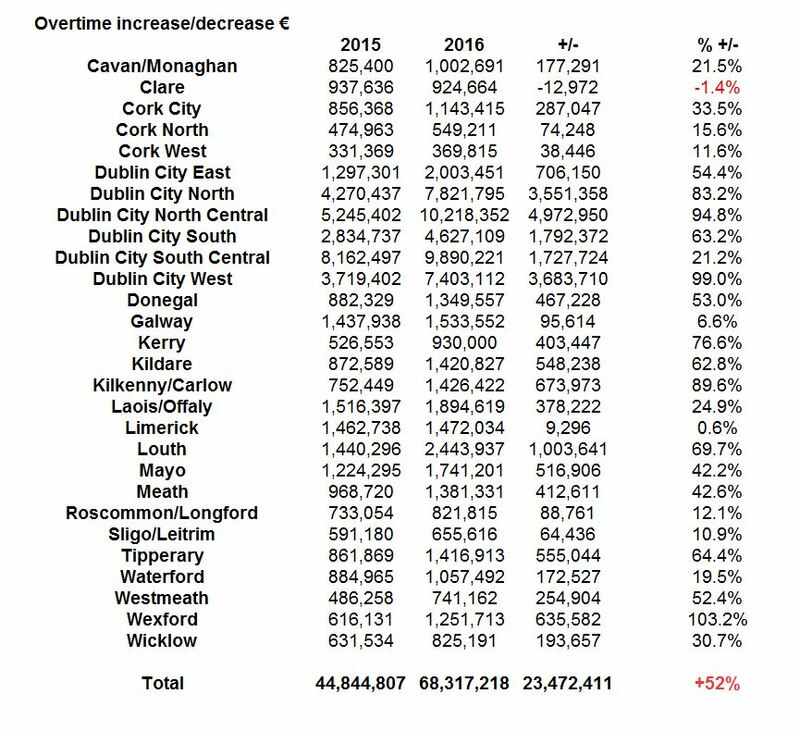 As previously mentioned, Clare is the only county in the country to see a (very modest) decrease in overtime payments. “The nature of Garda work and the requirement that the Garda authorities respond, in some cases at short notice, to immediate policing demands means that there is a necessity to incur overtime expenses to ensure effective policing,” a Garda spokesperson said. In addition, a number of police led operations require the deployment of extra resources on overtime. This includes the implementation of anti-crime and anti-burglary initiatives such as Operation Anvil and Operation Thor. Similarly non-crime related events within the general public can require overtime to police effectively. Operation Thor is the gardaí’s multi-strand national anti-crime strategy launched in November 2015. Anvil meanwhile is an older project targeting organised crime stretching back to the last decade. Thor in particular in recent months has led to a string of operations leading to hundreds of arrests and high-profile drug stings, such as the €850,000 worth of cocaine and heroin seized in Tipperary last month. TheJournal.ie requested comment from the gardaí as to the specific reasons for the massive jump seen in 2016. A response had not been received at the time of publication. While the jump in overtime spend is significant, figures from the pre-recession Celtic Tiger era were significantly higher. In 2007 and 2008 the total figures were €135.4 million and €112.5 million respectively. In 2011 the figure was €62.6 million, which fell by more than half to €31.2 million the following year. The yearly spend by division has been increasing steadily ever since, although the 2016 jump is easily the biggest seen this decade. Often, relatively junior gardaí can rack up huge overtime expenses in the course of a single year. In 2015 for example, the two highest annual bills for individual gardaí were paid to rank-and-file members and totalled €62,996 and €51,142, equating in the former case to a trebling of the salary of the Garda concerned. Email “Garda overtime rises massive 52% as pressure of battling Irish gangs takes its toll”. Feedback on “Garda overtime rises massive 52% as pressure of battling Irish gangs takes its toll”.